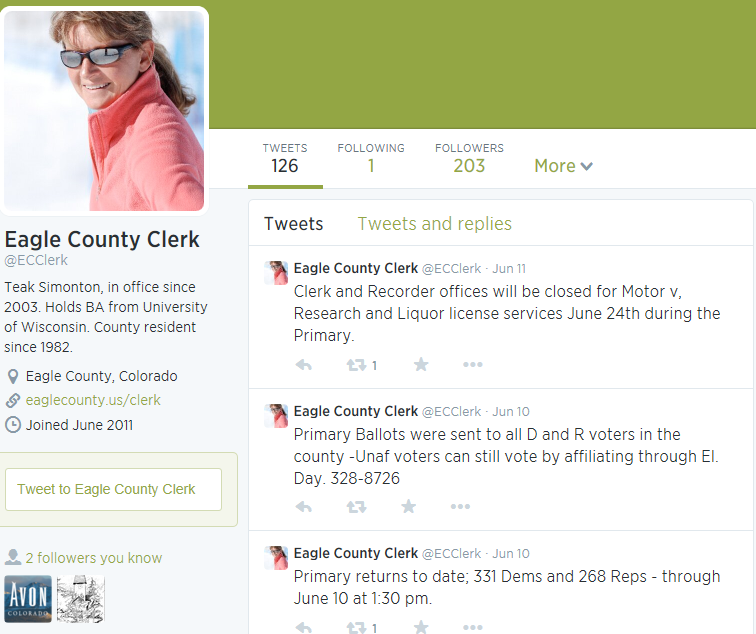 Eagle County’s (elected) Clerk and Recorder is Ms. Teak Simonton. Shown here in her newly remodeled office in the County building. Teak is happy to tell you just how much she saved on her new office furnishings – buying some of them from the specialty – thrift shops in Eagle County. 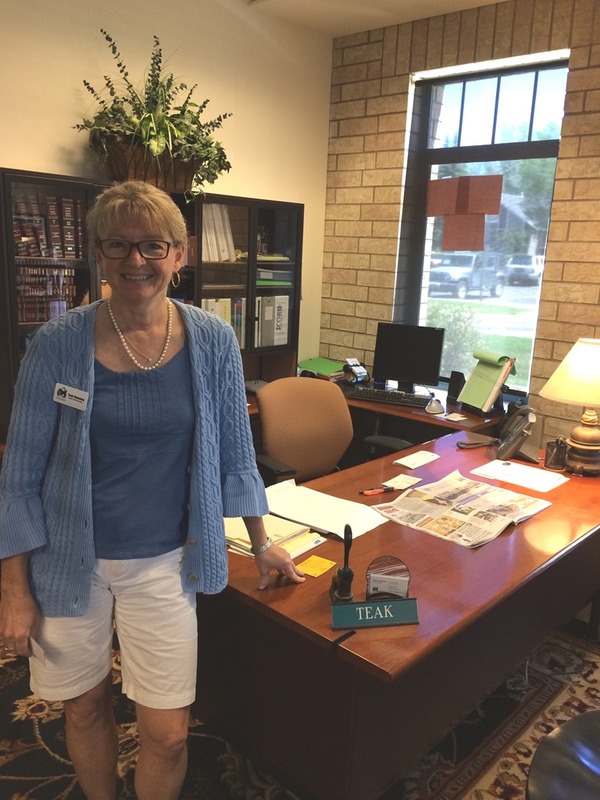 Teak and her election team at the Clerk’s office are busy preparing for the Tuesday, June 24th Primary election day for both political parties. Teak did mention that she thought the number of (currently returned ballots from the U.S. Mail – Friday, 13 June) was a bit higher than usual for a off-year Primary race. Approximately 1,600 ballots by COB last Friday, June 13th 2014. Teak wants to remind everyone with a SmartPhone and a free “Twitter” account – to subscribe to her election nite “tweets” (Twitter – @ECClerk) to be the first to know the Primary election results posted just after 7PM, Tuesday nite – June 24th. Teak traditionally posts incremental election tallies – as the Ballot counting continues – starting right after 7PM on election nite. Be the first to know, because you read the ECT – and learned just how to stay in the know on election nite! Well – it’s an Annual Event – arguably one of the most popular sponsored by the Vail Valley Foundation – this Summers FIRST! 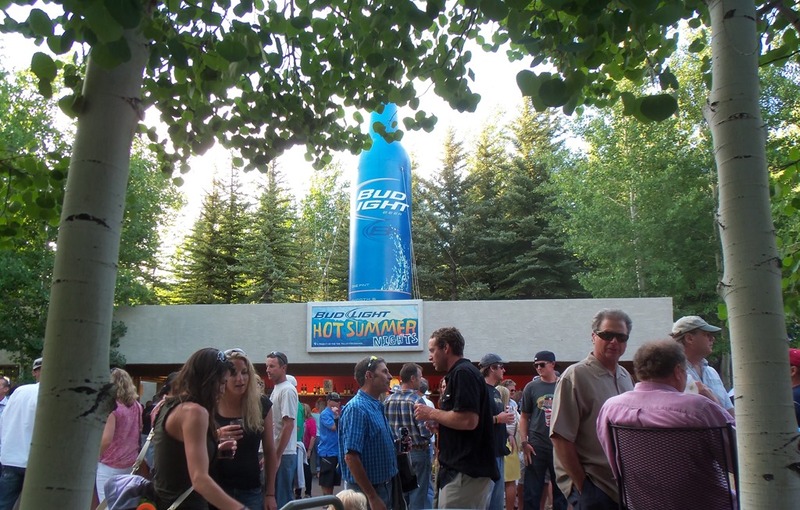 Hot Summer Night’s FREE concert, Tuesday, June 17th 2014 (6:30PM) at the recently (remodeled?) Ford Amphitheater in Vail. This weeks opening Concert features the music of “Rusted Root” a Pittsburgh, Pennsylvania based band. Well? Well…at least you’ll know the location of our Eagle County Sheriff Candidates – at the start of this Tuesday’s night – HSN, concert!